George H.W. Bush's casket has arrived at St. Martin's Episcopal Church in Texas where he will lie in repose overnight. As a military band played, pallbearers carried the flag-draped casket of the former president into Houston’s St. Martin’s Episcopal Church, where the Bush family regularly worshiped. Wednesday night’s music included the opening notes of Hail to the Chief. Among those greeting the motorcade were the city’s top two leaders, Democratic Mayor Sylvester Turner and Republican County Judge Ed Emmett. On Wednesday evening, Bush's body was flown by Air Force One to Houston's Ellington Air Field following a state funeral service at the Washington National Cathedral in Washington, DC. 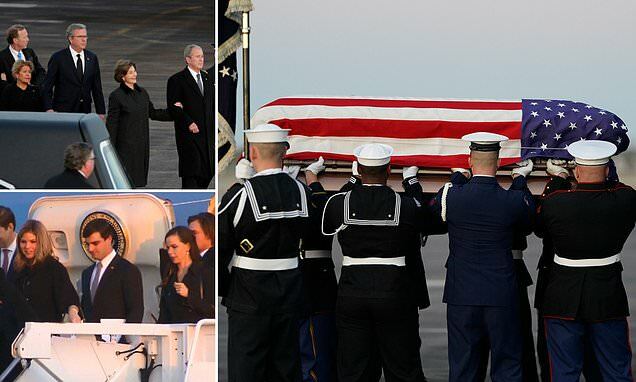 While Bush's casket was escorted from the aircraft to the hearse, former President George W. Bush, his wife Laura, and several other family members trailed behind. A motorcade then drove 45 minutes to St. Martin's Episcopal Church where about 1,200 mourners are expected to attend the service at the church on Thursday morning. Delivering a eulogy is James Baker, Bush's former secretary of state and longtime confidant. Bush's grandson George P. Bush will give the other eulogy. He is the Texas land commissioner. Bush and his wife, Barbara, worshiped at St. Martin's for more than 50 years. 'It is our turn to show our respect and support as our congregation, as well as our nation, grieve this loss,' reads a message on the church's website.